Each year, Fire Chief Michael Duyck honors citizens and Fire District employees who exemplify selflessness, stewardship, and commitment to serving their community. 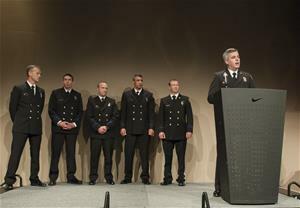 During Saturday morning’s celebration, Chief Duyck shared stories about harrowing rescues performed during a residential fire, a difficult extrication incident, a dangerous rescue of a citizen trapped in a trench, and other emergencies, where men and women put their own lives in peril to save others. He also recognized community service, academic excellence, time in service, retirements, distinguished conduct, and notable endeavors by Landmark Ford in Tigard to support the District’s ongoing efforts to create safer communities. Below is a list of honorees and award descriptions. For the outstanding achievement of earning a Bachelor of Science degree while working for the District. For the outstanding achievement of earning a Master of Science degree while working for the District. For their extraordinary actions that saved several lives during the Southwest 139th Avenue residential fire in Beaverton in September 2014. For their extraordinary actions and care demonstrated during a difficult extrication incident in Clackamas County in June 2014. For their extraordinary performance and integral role in the rescue of a citizen trapped in a trench in March 2014. For demonstrating a courageous and selfless technical rescue of a citizen in March 2014 under particularly dangerous circumstances. For supporting TVF&R’s efforts in community safety and public education. For providing a quick response and lifesaving CPR while off duty in May 2014. The Academic Excellence Award may be awarded to any member who has graduated from a four-year accredited college or university, or demonstrated academic excellence while a member of the District. The Special Unit Citation may be awarded to any organization, unit, or specially constituted team within the District, which has worked together toward a common goal. The Citation may be awarded for a specific performance of exceptional quality or for continued, professional performance, and dedication to duty by the organization, unit, or team, as a whole. The Distinguished Service Award may be awarded to any member of the District who has acted with professionalism and efficiency when faced with a specific danger and/or adversity, and who has made a substantial contribution to EMS, the fire service, or the community in the carrying out of his or her duties properly despite this danger and/or adversity. The action for which this award is given should be considered exceptional by his or her peers. The Medal of Valor may be awarded to a member of the District who, in the line of duty, or while off-duty, distinguishes him/herself in the performance of an act of courage involving risk of imminent serious physical injury, with knowledge of such risk, for the purpose of saving or protecting human life. Or, in the course of an extended investigation of a nature where he or she is continuously and singly exposed to grave personal hazard, willingly accepts such risk in the service of the District.